The Kyros by Rointe is a sleek and sophisticated electric radiator with innovative technology to match. Using efficient thermal fluid to retain more heat, a unique room temperature monitoring system, and a wealth of energy-saving features, the Kyros is the perfect fit for any modern property. Rointe Kyros electric radiators come with an all-new graphic interface to make programming a breeze and can also be purchased with a remote control for easy adjustment from the comfort of your chair. Download the¬†manual for the Rointe Kyros here. Download the manual for the Rointe AIR Remote Control here. Installing Rointe Kyros electric radiators is a straightforward process that requires very little DIY experience. All necessary fixtures and fittings are included with the radiators to help you get started. Use the template and the screws provided to mount the brackets to the wall, and then mount the radiators onto the brackets; they can then be plugged into the nearest 13A socket. The Rointe AIR Control requires two AAA batteries and comes with a transparent wall holder that can be mounted in a convenient place. The AIR Control Remote is wireless and a uses bi-directional infrared connection to interact with Rointe heating products. The remote can send signals to your heater from 3m away and can also receive infrared communication from heaters in a 1m radius. Rointe Kyros Radiators come with a 3 Year Manufacturer‚Äôs Warranty on the electronic components and a 20 Year Warranty on the radiator body. Rointe AIR Control Remotes come with a 2 Year Manufacturer‚Äôs Warranty. Rointe Kyros Electric Radiators and Rointe AIR Control Remote Controls are available with free next working day delivery. Next working day delivery is available when you order before 12pm (excluding weekends). In the unlikely event that your Rointe products arrive damaged, any faults must be reported to us within 24 hours, otherwise an additional ¬£12.50 charge will apply. 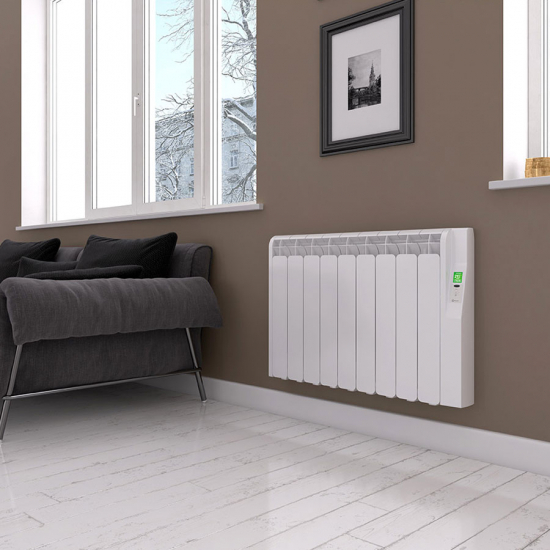 Third generation Rointe Kyros Electric Radiators set a new standard for modern home heating. Providing enhanced energy-saving features, these new radiators are an ideal heating solution for a wide range of domestic and commercial applications. With their minimalist and stylish design, the Kyros range effortlessly blends into the background of any interior design scheme. Rointe Kyros radiators use thermal fluid for exceptional heat retention, enabling them to maintain comfortable temperatures without drawing too much power from the wall. The perfect energy-saving system, these electric radiators disperse heat through the eye-catching vents on the front of the heaters ‚Äî keeping warm air in continuous circulation rather than letting it gather toward the ceiling. Using advanced heating technologies, the Kyros range is able to maintain temperatures within ¬±0.25 ¬∞C and includes a ‚Äòunique fuzzy logic‚Äô control feature which works to prevent extreme temperature fluctuations. Where standard heaters create heat spikes and sudden lows as they turn on and off, Rointe‚Äôs fuzzy logic system modulates heat output in a way that will ensure even and comfortable heating, as well as economical energy usage. All Rointe radiators come with an Open Window Detection function which will switch the heater to anti-frost mode once it senses a temperature drop of 4 ¬∞C within a 30-minute period. This energy-saving feature prevents your heaters from wasting electricity by trying to heat a rapidly cooling room in the event that a window is left open by accident. To minimise energy consumption, the Kyros range includes a 24/7 digital programmer that enables you to create a bespoke heating schedule around your lifestyle. Select comfort and economy temperatures for every hour of every day or use one of 4 pre-set modes that reflect common daily routines. An optional remote control is also available if you‚Äôd prefer to make any adjustments to your heating from the comfort of your chair. With the new third generation Kyros, Rointe have included an easy-to-use, graphic menu system that‚Äôs both user-friendly and crystal-clear. From this display, you can access Rointe‚Äôs new E-fficiency mode and keep an eye on your energy consumption. For quick, ‚Äúat a glance‚Äù reference, the interface on the Kyros will change colour depending on its efficiency ‚Äî green for efficient, yellow for average, and red for excessive. Also featured in third generation Kyros electric radiators is the all new ‚Äòuser mode‚Äô that allows you to customise the radiators‚Äô temperature range. Ideal for business or communal use, user mode can restrict the maximum and minimum temperatures of Kyros electric radiators to avoid tampering or wasteful heating. Rointe Kyros electric radiators can be installed DIY with ease, so unless you want a hard-wired finish, you won‚Äôt need to pay any additional fitting costs. Fixtures and fittings come included with every unit and a handy template is also supplied to help you mark out where the screws will need to be drilled into the wall. Please note: in the unlikely event that your Rointe products arrive damaged, any faults must be reported to us within 24 hours, otherwise an additional ¬£12.50 charge will apply.